The second floor of this office building contains flexible space, with desirable professional co-tenants and ample parking. Space can be further broken down into as many as three smaller offices. 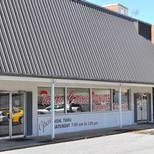 Excellent location for a professional office in the heart of Uptown Martinsville, VA.